A wonderful story in honor of our approaching Educator of the Year nomination deadline (April 28) in which you can recognize an individual educator or a team of educators who have made a positive impact on your child’s life. This story is about Allison who has Mosaic Down syndrome and is making her way through life, undaunted by challenges, and changing perceptions. Each month NDSS highlights the two stories with the most votes on the My Great Story site and they are featured as the Stories of the Month. The votes are reset at the end of each month. The top voted story this month is, I Know I Can, by Jennifer Hinds from Laguna Hills, California. 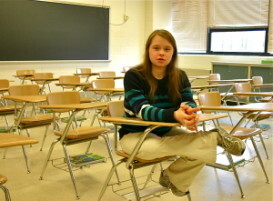 Her story was already featured in NDSS’ e-newsletter in September, 2010. Click here to view Jennifer’s story, which can be found on page seven. 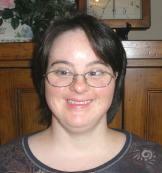 To add your own story, or to vote or comment on others, visit the NDSS My Great Story website. This past weekend, several families from the Down Syndrome Association of Orange County and United Cerebral Palsy – Orange County enjoyed another Surf Day hosted by our friends with Best Day Foundation. 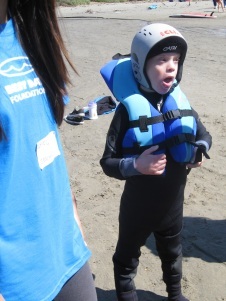 Best Day Foundation helps children with special needs build confidence and self-esteem through safe, fun, adventure activities like surfing, bodyboarding, kayaking, snow sports, and more. Pictures from this past weekend will be posted on their website soon at www.bestdayfoundation.org. Check out the article and photos from Surf Day last November with Best Day Foundation. Future Surf Day’s will be announced soon. Pictured to the left is Josh Brocard, enjoying his BEST DAY at the beach! Research has shown that little progress has been made in the quality of a physicians’ delivery of a diagnoses of Down syndrome. All too often, inaccurate information is being provided to expectant or new parents. Typically, only the challenges of raising a child with Down syndrome are presented, and the positive aspects of how people with Down syndrome can live full lives and moreover enrich our lives and communities are not given. Our Hospital Outreach Volunteer Committee visits hospitals throughout greater Orange County, providing materials and support to hospital staff and social workers, to the offices of genetic counselors, and OB/GYNs, educating them on the potential of people with Down syndrome and assisting them with resources so that they can more comfortably and accurately deliver a diagnosis. This information also provides a line to help and information after the news is given. The volunteer work performed by this important committee positively impacts so very many people; from the social workers and families to the professionals who are delivering the diagnosis. 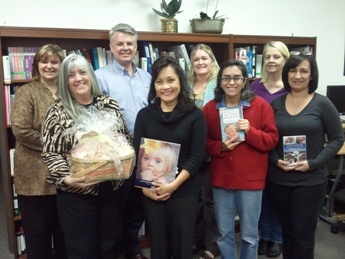 To our volunteers: Your efforts are recognized, and DSAOC appreciates you! If you are interested in being part of this volunteer committee, please contact Kellie Perez at kperez@dsaoc.org.